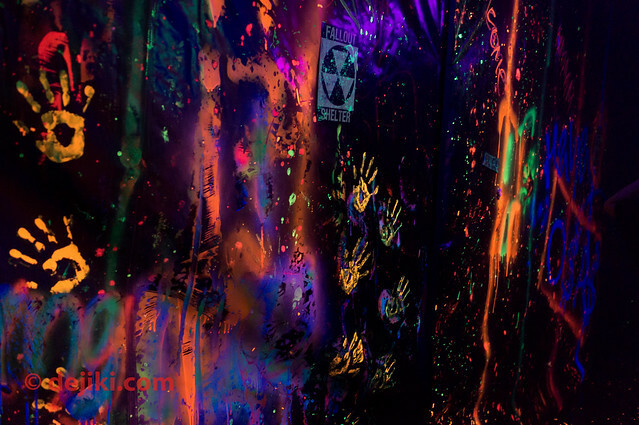 Experience the apocalyptic end of the world filled with destruction and a zombie outbreak this Halloween at Museum of Horrors. Presented by SCAPE And Movie Mania, Museum of Horrors returns for the third time at the SCAPE building. For the first time, the Museum of Horrors will have an elaborate concept of multiple enclosed zones linked with dark scare tunnels. The experience is also presented in a 4D format, combining 3D backlight effects with wind, smoke, smell, water and lighting effects. 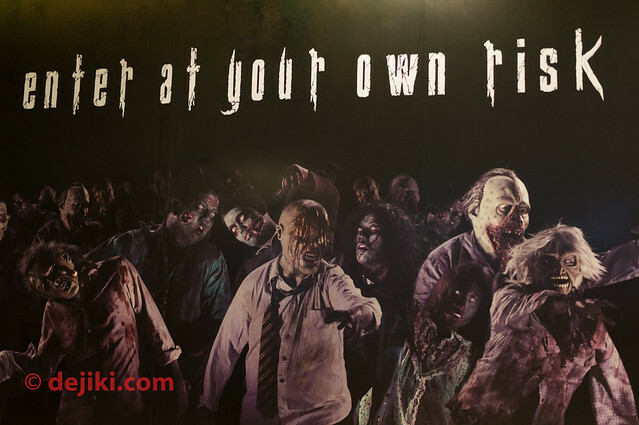 This attraction is heavily inspired by zombie horror, such as The Walking Dead and Left 4 Dead series. It is designed with multiple endings, so guests can return again and have a different experience each time. There is actually a narrative behind the entire experience. Briefly, it is about a Scientist’s desperate cause to save his wife from an infection. In search for a cure, the scientist started a zombie outbreak. The first room features a video log recorded by the Scientist. Be sure to watch it but don’t stay too long here! The next few rooms depict many parts of the scientist’s lab. There are a lot of props everywhere, as well as multiple encounters with scare actors and zombies. Towards the middle, the experience changes into a 3D maze. Goggles were handed out for this part of the experience. I was impressed that these googles are actually acrylic safety goggles with the 3D lenses inside. It is a nice touch compared to the usual flimsy 3D glasses (paper or thin plastic). This portion of the maze is also where the most effective scares come in. The 3D effect works very well, creating a disorienting walkthrough experience. 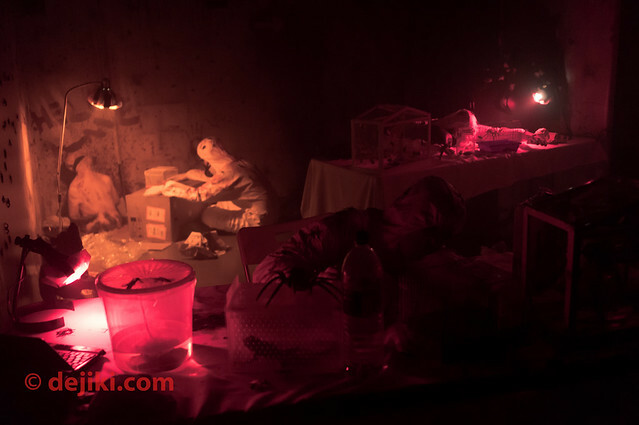 Unlike other haunted houses and mazes that I’ve visited, Museum of Horrors III was a very quiet experience – which adds on to the whole foreboding creepiness. There are numerous scare actors and well-placed spots for them to attack. There are even some surprises in their attacks. There are certain parts of the maze that is VERY dark – so dark that I couldn’t even see where I was walking to. I am unable to give an accurate estimate on how long a walkthrough will take. I was brought around the maze in a special tour and everyone spent a fair bit of time taking photos and examining the props in detail. There is a serious amount of props in the maze that we had to walk slowly and go around them. One thing I felt that could be improved is the storytelling. 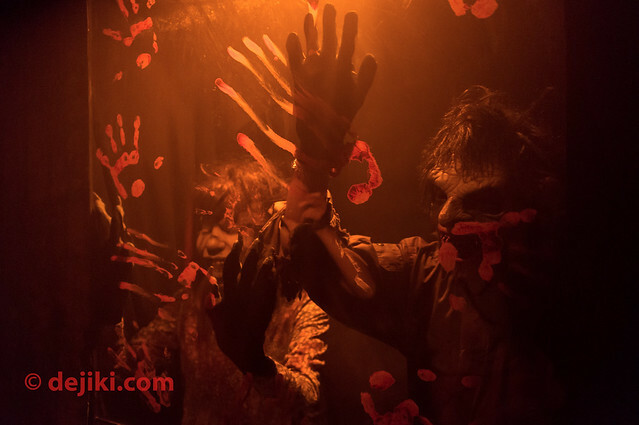 After the first room, it leaves a lot for the audience to interpret because none of the scare actors would talk and there is just more and more zombies – the outbreak just becomes worse, room after room. That is alright for most part of the experience, it’s a zombie apocalypse after all – but I feel that something needs to be added to the ending for a fulfilling conclusion. On the ending: According to the producer, the ending may change each day – those who visit the maze a second time on another day may experience a different ending. 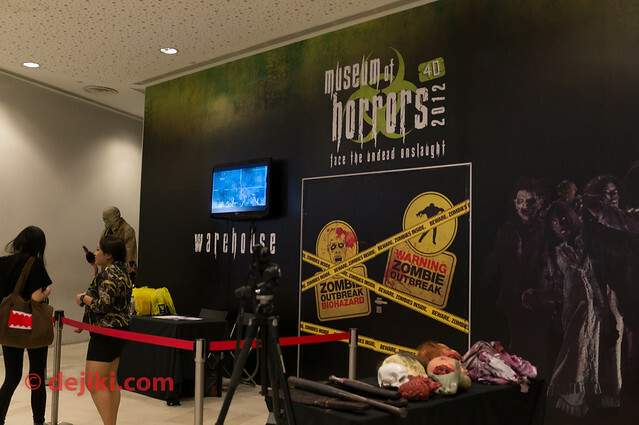 Conveniently located at SCAPE, Museum of Horrors III could be an easy way to spice up your day at Orchard Road. Tired of shopping? 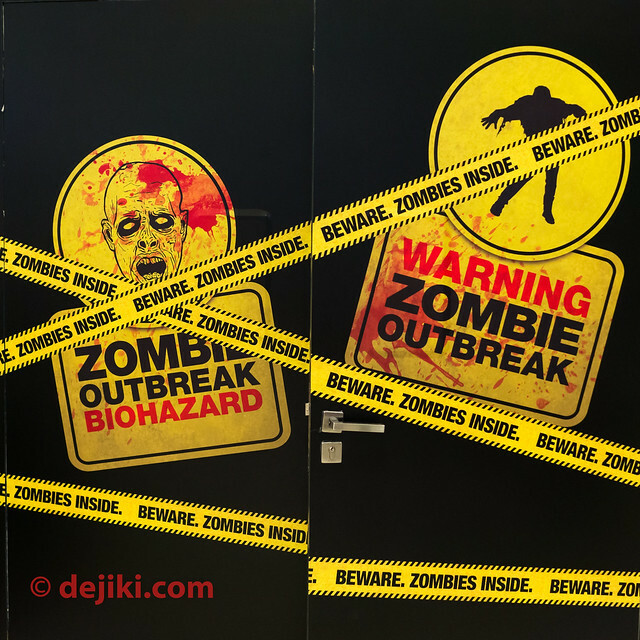 Get your heart pumping and survive the zombie outbreak! Click here for more information about Museum of Horrors III and to buy tickets online. 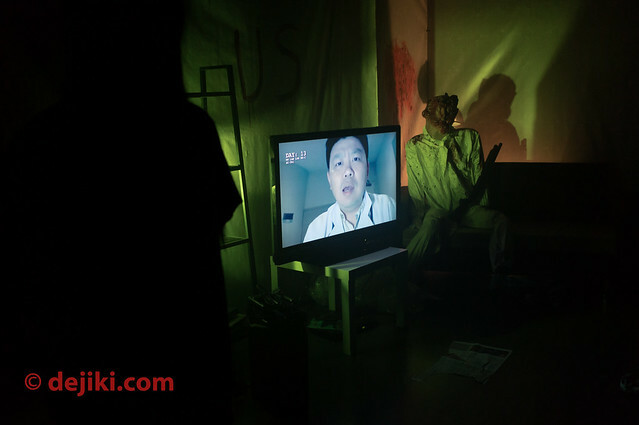 Special thanks to SCAPE for inviting dejiki.com to the preview for Museum of Horrors III. 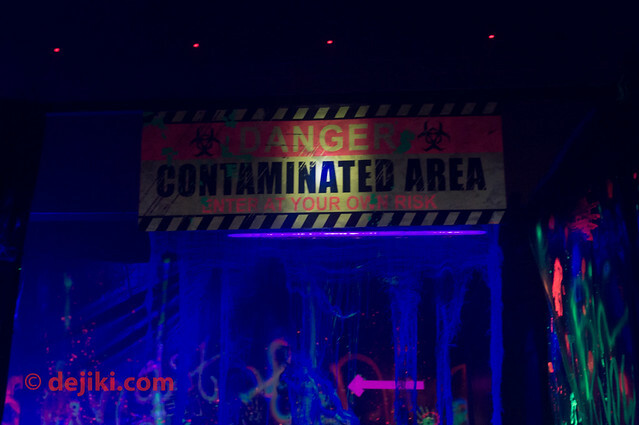 Hi, after you have been through this attraction, would you say that any of the haunted houses at USS is scarier than this? I would say that the Haunted Houses at USS are scarier because they use a lot more effects. Museum of Horrors is more towards the creepy side. Nope, you can use mobile phone as a light source in the maze, if you want to. Hi. sorry for asking so many questions. May i know u went on a weekday or weekend? The place seems very empty, so i was wondering inside the warehouse will it be very little people as well. As I’ve mentioned in this entry, I went into the warehouse during a media preview. It will be different during normal operations, as there were only 6 people in the warehouse at that point in time. Having said that, there will be control over the number of people let into this attraction so that the experience will not be affected.